Thread: How to use yoyos? ... in a less conventional way? The ones that I've seen are usually used in an all-over vintage style. I have used yoyos for flowers in the basket block and I like to use the small yoyos for flowers for Sunbonnet Sue to hold. 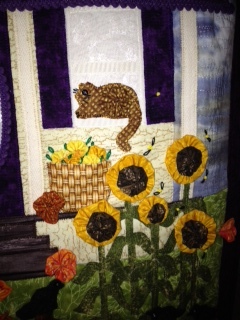 I saw a quilt where there was a birdhouse and yoyo flowers underneath. In the center of each flower they used embrodiery floss to tie the center with the ends hanging out.........it was the cutest wall hanging! I have seen them used as borders, animal bodies, leaves, purse bodies and so many that I cannot name them all. Right now, my yo-yo's are in a large clear glass jar with a cover in the living room. They are colorful and a little whimsical using them as a decorating accessory. It wasn't my original intention, but until they are sewn together they have a legitimate function. I bought yo-yo maker yesterday (made by Clover) because I wanted to make a few toys for some upcoming kids birthdays. Lady doing the yo-yo maker demo had several pieces for show and tell. One of the pieces grew from coffee table topper, to table runner to single bed cover and she plans to take it all the way to queen size cover. All she does is when she has some left over fabric she makes yo-yos and attaches them together and she keeps doing that regardles of color. Her creations are square, but hey, you can have them in any or all shapes and sizes. I think I am going to make one. Also, yo-yos are very useful in making bags and totes to cover less then pretty handle placement or magnetic clasp attachemnt. Enjoy! 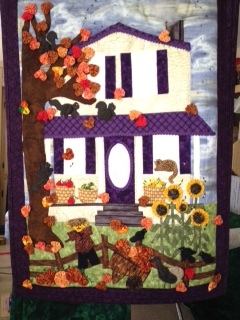 Here is a fall wall hanging I made from a Marcia Layton pattern. She is the queen of yo yos used in wall art. 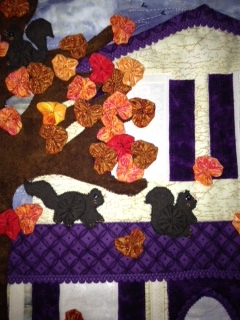 I saw her at a trunk show at Judy Hansen's shop Quilt Shop of Deland (Florida). The first pic is the whole wall hanging and the other 2 show some detail. The yellow "spot" on the window shutter is a bumble bee, but the black wings don't show in the pic. The wall hanging is about 24x32. I did a Red Work wallhanging that said, Bloom where you're planted and I did a row of yo yo flowers on narrow green Rick rack stems. It was a teacher gift and she hung it on her classroom door. Sewing with Nancy did a segment on yo yo flowers and the guest did cute little yo yo animals on a quilt. I knew a quilter once who made some curtains and used yo yo's across the bottom in 2-3 alternating rows. They were adorable! It had a lacey look to it. When I was little, my Grandmother made me a Jingle Bell Jack doll out of yo-yo's. He was adorable! I've also been thinking about using some over-sized ones as the center circle on some Dresden Plates. I agree... yo-yo's are too, too cute! I was making 2 train quilts for newborn boys (twins) and I used the yo-yo's as the wheels on the train since I didn't want to use buttons. I appliqued around them to make them secure.